This scarf will turn heads with its beautiful snowflake design! 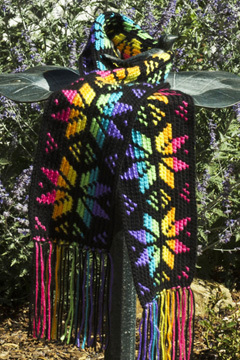 It can be made in the colors shown or any colors of worsted weight yarn you choose. The scarf is a lot easier to make than it looks, since only basic stitches are used! If you already know how to make a chain and a single crochet, as well as how to read and follow a crochet pattern, you’re ready to make this scarf! The pattern is easy to follow and includes full instructions for making the scarf with the fringe. It also includes step-by-step photos for working in the back bump of the foundation chain, starting a row (joining) with a sc, working in the back loop and changing colors. There are no tails to weave in on this scarf, since the tails are turned into the fringe. The pattern also includes a chart for making the snowflakes, if you prefer working from a chart! Note: Photographed model made with Caron Simply Soft in #9727 Black, #9604 Watermelon, #9605 Mango, #9606 Lemonade, #9607 Limelight, #9608 Blue Mint and #9610 Grape.